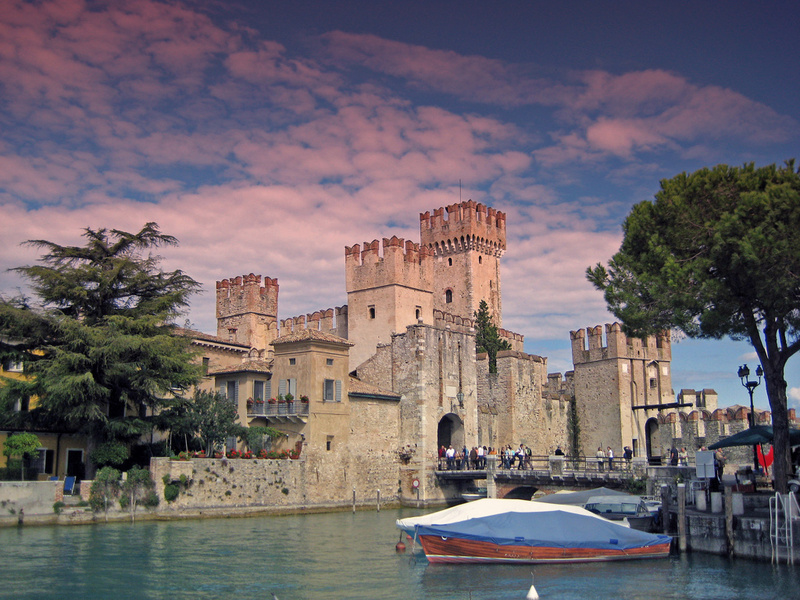 Holidays in Sirmione ↔ Discover Lake Garda! 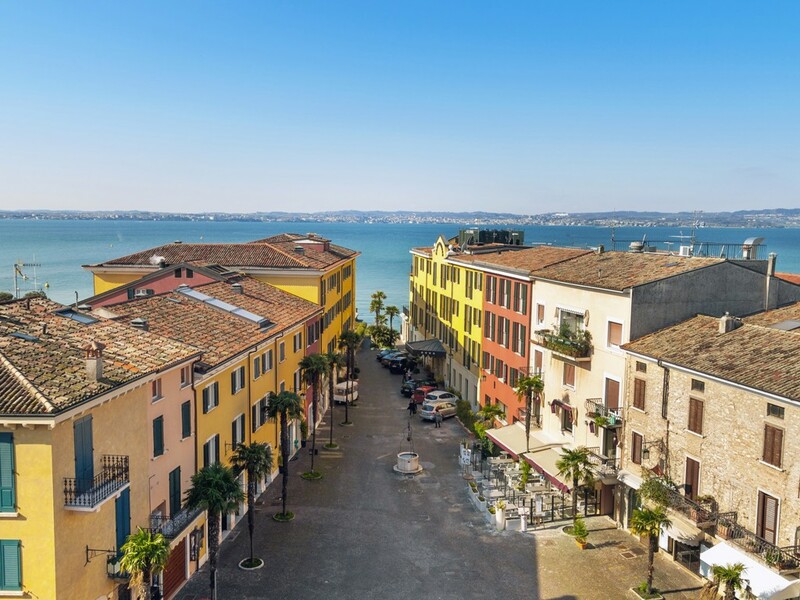 Sirmione is a historic village located at the tip of a peninsula in Lake Garda and attracts numerous beach holidaymakers, day visitors and spa enthusiasts. Sirmione is a unique location right in the middle of the south bank on a narrow peninsula, which protrudes about 4 km into the water. 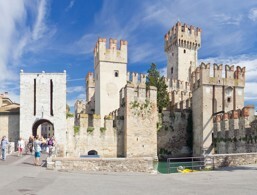 This makes the town of Sirmione one of the most visited places at the lake. Here, you have day tourists on a sightseeing tour as well as those who stay for longer. The majority of the visitors then flock to the central street Corso Vittorio Emanuele and Piazza Carducci, which form the centre of the picturesque, traffic-free old town. These areas cover more or less the entire spit, while the newer suburbs and the residential area spread towards the hills. The former fishing village today has dedicated itself entirely to tourism. Paved alleys, lovingly maintained historic houses, flower-adorned facades as well as classy hotel complexes and quaint inns can be found almost everywhere. In the evening, the old town is transformed with a wonderful atmosphere. North of the city, idyllic olive and cypress groves can be found, and it's an incredibly romantic area for walkers. 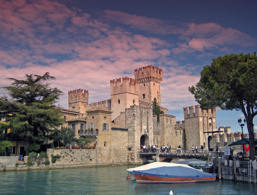 For a long time, Sirmione has been the best example of a thriving tourist destination at Lake Garda. 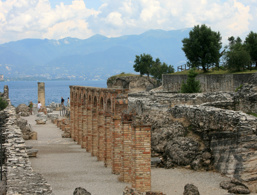 Even the ancient Romans met at the sulphurous springs for a spa vacation. The main attraction is not only the famous thermal bath but also the moated castle, which is considered one of the most beautiful in Europe, and like so much in the region, goes back to the noble family of Scaliger. It's a unique bathing experience in blue-turquoise waters with the amazing limestone terraces at the extreme tip of the peninsula. 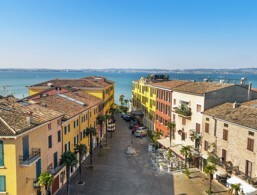 Discover the vivid centre of Sirmione. The peninsula of Sirmione offers many cultural sights as well as picturesque beaches. Discover the beauty of the peninsula of Sirmione. 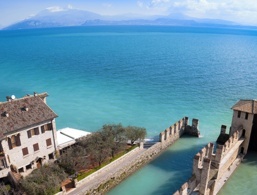 Discover the picturesque holiday resort Sirmione! Together with Piazza Carducci, the main street Corso Vittorio Emanuele forms the heart of the old town. Inviting cafes, gelaterias, shops and posh boutiques all lineup. Whether it's the main holiday season or not, here you always have to expect a lot of people. 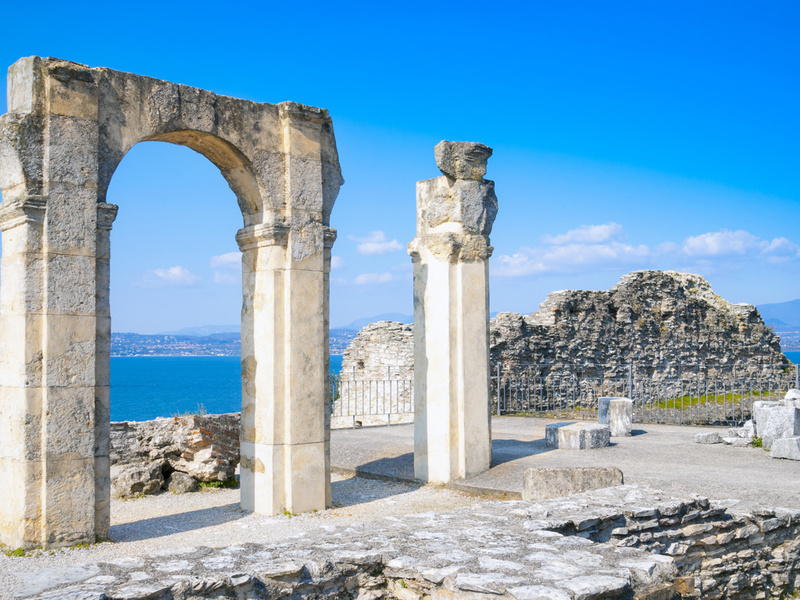 Far less visited, but no less worth seeing are the winding lanes behind the Skaliger Castle, where you can walk past the parish church and olive groves to the grottoes of Catullus. With its towers, battlements, drawbridges and walls, the moated castle at the entrance to the old town is one of the most popular photo opportunities in Sirmione. It was built around 1250 under Mastino I della Scala and later taken over by the Venetians. As the complex was primarily used as a barracks, there is relatively little to see inside. 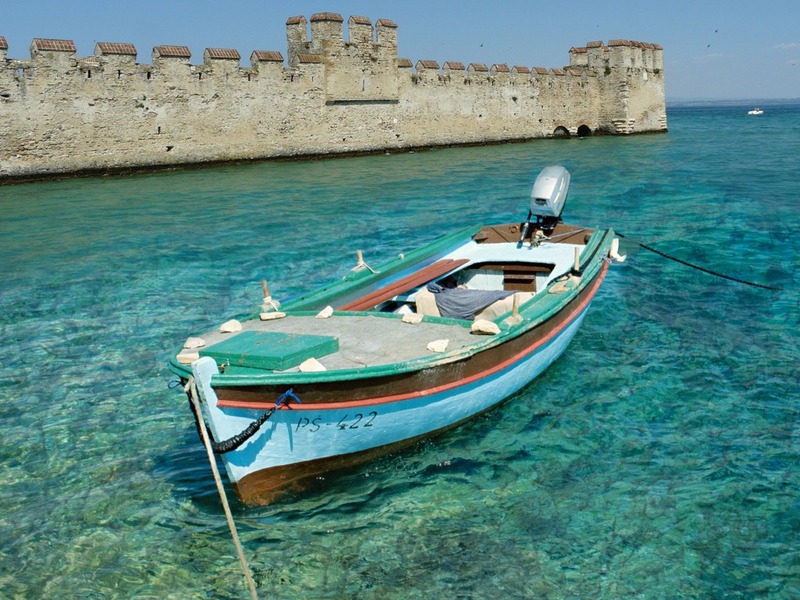 However, the fortress is architecturally more interesting, especially the 30-metre high central tower with a particularly beautiful view of the lake or the fortified harbour. 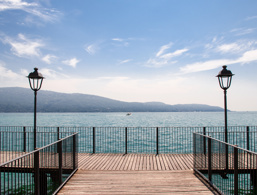 Despite the beauty that can be found today, in the 13th century, numerous followers of the religious community of Pataria were cruelly executed causing Sirmione to be the backdrop to a horrific event in its history. The parish church of Santa Maria Maggiore stands on a hill in the east of Sirmione. You can enter the church Via Antiche Mura, the path of the old city walls. This sacred building from the end of the 15th century sits on the foundations of a Lombard church and has a porch with Roman columns, frescoes, a marble altar and a beautiful organ. San Pietro is from the early Middle Ages and is a bit remote and hidden in an olive and cypress garden in the northern part of the old town. It dates back to Lombard monks and is adorned with a Byzantine-style fresco which was created at the beginning of the 14th century. The interior is also decorated with beautiful murals. Next to the church stands a bell in memory of the soldiers who died in the two world wars. 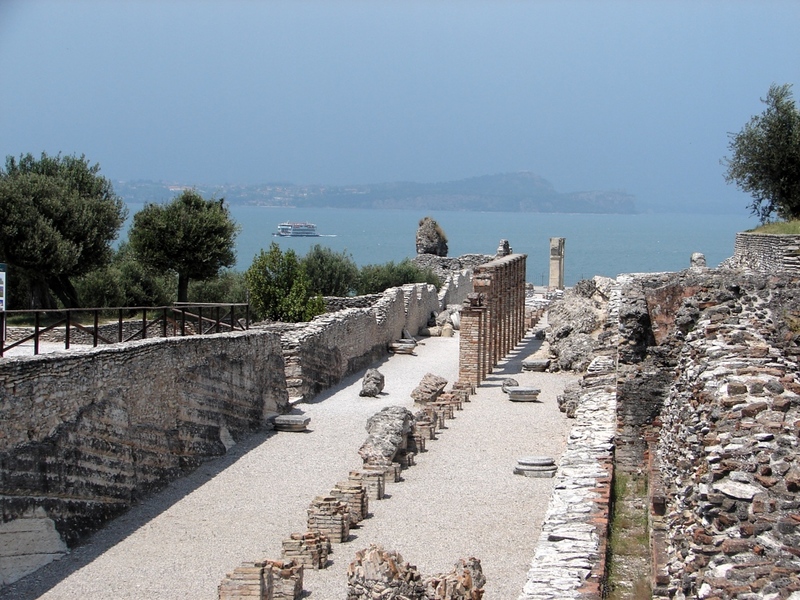 The grottoes of Catullus aren't really caves, but instead, they are the sprawling ruins of an ancient villa complex at the tip of the peninsula. The origin of the name and its intended use is still not clear, the theory is that it was the Roman Poet Catullus’ country villa although he never lived there. The former multi-storey buildings are collapsed and partly overgrown but can be visited easily. At the entrance to the Catullan caves, there is also an antiquarium with mosaics and frescoes. On the very edge of the peninsula, you will find an extraordinary geological formation. The shore is covered by an up to 100 meters wide ring of limestone slabs. The white plates lie only slightly below the surface of the cool water and transform it into a beautiful turquoise colour. The accommodations at Sirmione were rated 4 out of 5 stars by 26 users.